Basingstoke MP Maria Miller visited SETsquared’s innovation hub for high-tech start-ups and entrepreneurs in Basing View on Friday (8 January) to celebrate its Entrepreneurship Training Programme which was highly commended at the Enterprising Britain Awards. The ground-breaking programme was highly commended by the UK Government in the Building Enterprise Skills category at the awards in November last year. 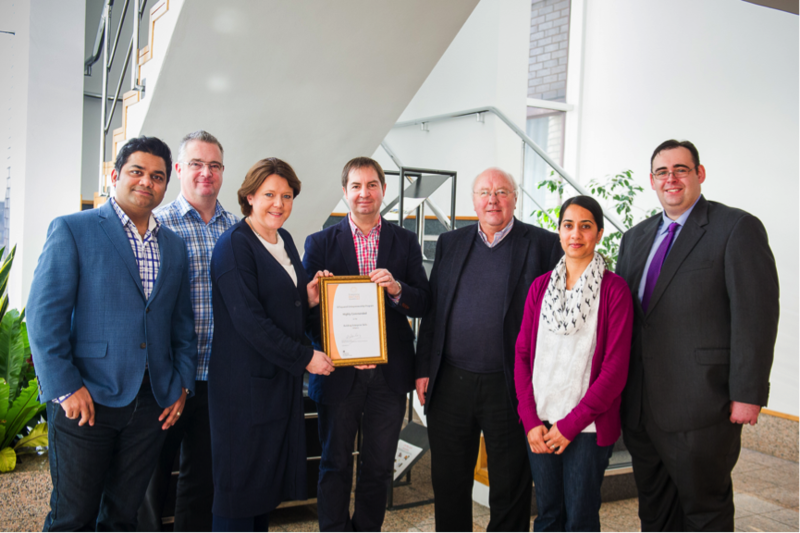 Maria Miller met with SETsquared’s entrepreneur in residence, Adrian Braine, as well as innovators from start-ups including RazorSecure, Xscalo, Evergreen and NowTranscribe, to congratulate the team on its recent accolade. The programme, which is run across Southern England and works to turn entrepreneurs’ technology ideas into business investment propositions, was introduced into Basingstoke in partnership with Basingstoke and Deane Borough Council and has kick-started some fantastic new tech businesses in the area. The course gives delegates a opportunity to pitch to a panel of investors and get candid feedback on their businesses proposition and training on marketing analysis, funding strategies and business plans. Maria Miller, MP for Basingstoke, said: “I was glad to meet some of the entrepreneurs based at the SETsquared hub in Basingstoke and hear from them how this important business support programme is helping them to develop and grow. I look forward to hearing about their future successes.